Reddy is a small little town by the sea side situated 33 k.m. away from Sawantwadi and 22 k.m. from Vengurla. Town known for manganese mines for years is becoming more and more popular nowadays for Sayambhu two handed Ganesh Temple. The Ganesh idol in this temple was found 8 feet inside the earth. In past the town was always busy in manganese transportation. Trucks were used to bring magnese found in the mines to the port. Mr. Sadanand Kambli who was working as a truck driver dreamt off Lord Ganesh early morning on 18th April 1976. 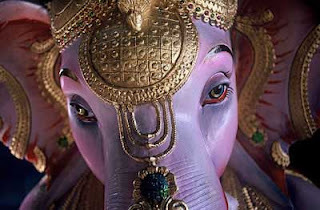 Lord Ganesh told him about the location of the idol and asked him to get the land freed. Sadanand then started digging the place with help of his friend Mr. Juwelkar and other villagers. Finally the Gnesh idol was digged out on 1st May 1976. Ganesh idol is carved out of Murju stone and is in seating posture. More importantly this Ganesh idol is two handed as against four in usual. Devotees feel blessed to see this 6 feet tall and four and half feet wide, beautiful, divine idol of Lord Ganesh. Forty days later they found a staute of mouse which is Lord Ganesh’s vehicle in a near by mine which they kept in front of Ganesh’s idol. During MAHABHARAT times Pandavas and Rushimunis (priests) built many temples and historians believe that this Ganesh Idol is from one on those temaples. Today we have beautifully built Ganesh Temple here. Just 300 feet away form the temple is the beautiful seashore. This place is very beautiful. Other nearby places to see are Mauli Temple, Sidheshwar temple, Yashawant Gad (fort) and Terekol keri which is 7 k.m. away from Reddy. Many beaches, temples- (Navadurga -Mauli also)-forts.